Midwifery Today > Articles > Free Articles > Is the Participation of the Father at Birth Dangerous? Is the Participation of the Father at Birth Dangerous? A century ago, when most babies were born at home, such a question would have been deemed irrelevant. At that time, everybody knew that childbirth is “women’s business.” The husband was given a practical task, such as spending hours boiling water, but he was not involved in the birth itself. Today, the same question is still deemed irrelevant, even stupid. At the dawn of the 21st century, everybody knows about the importance of the active role of the father in the “birth of a family” Most women cannot even imagine giving birth without the participation of their “partner.” We have heard countless wonderful stories of “couples giving birth.” Fathers are welcome in the most conventional delivery rooms. If it is commonplace to dodge the real question, in spite of a conceptual mutation, this means that the issues are complex. In order to interpret such sudden and radical changes in concepts and behavior, one must put them into their historical context. It is essential to recall that the intriguing phenomenon we are studying began unexpectedly in most industrialized countries in the 1960s. Then, a new generation of women felt the need to be assisted by the baby’s father when giving birth. They started to express this new demand at the very time when births were more and more concentrated in larger and larger hospitals. From a historical viewpoint one cannot dissociate hospital birth and the participation of the baby’s father. This was also the time when the family had a tendency to become smaller and commonly reduced to the nuclear family, so that in the daily life of many women the baby’s father was the only familiar person. Furthermore the 1960s represent the time when the midwife became one of the members of a large medical team (in the countries where she had not completely disappeared). It is clear that the participation of the father was as an adaptation to unprecedented situations: it had not happened before in the history of mankind that women had to give birth in large hospitals among strangers; the nuclear family was unknown in any other culture and midwives had always been independent. Those who have been active witnesses of such behavioral upheavals remember how quickly theoreticians established new doctrines. For example I heard around 1970 that the participation of the father will strengthen ties between the couple and that we should expect a decrease in the rate of divorces and separations. I also heard that the presence of the father, as a familiar person, should make the birth easier and that we should expect a decrease in the rate of caesarean sections. The dawn of the 21 st century represents, thirty years later, the beginning of another phase in the history of childbirth. The current turning point is related to the fast development of “evidence based obstetrics” and “evidence based midwifery.” One of the first effects of a scientific approach is to stimulate a new awareness of the importance of environmental factors in the perinatal period. For example, we learned from a series of prospective randomised controlled studies that an electronic environment tends to make the birth more difficult and has no other effects on statistics than to increase the rates of caesarean sections. Evidence based obstetrics is instrumental in the preparation for the “post electronic age” in childbirth. First question: Does the participation of the father aid or hinder the birth? Those who are old enough to remember what a birth can be like when there is nobody else around than an experienced, motherly and low profile midwife are inclined to formulate the question that way. Our objective is not to provide answers but to analyze the many reasons why it is such a complex issue. There are many sorts of couples according to the duration of cohabitation, the degree of intimacy, and so forth. There are many sons of men: some can keep a low profile while their partner is in labor; others tend to behave like observers, or like guides, whereas others are much more like protectors. At the very time when the laboring woman needs to reduce the activity of her intellect (of her neocortex) and “to go to another planet” many men cannot stop being rational. Some look brave, but their release of high levels of adrenaline is contagious. The double language of human beings appears as the main reason why the complexity of such issues is underestimated. There is a frequent conflict between the verbal language and the “body language” of pregnant women. With words, most modern women are adamant that they need the participation of the baby’s father while they give birth; but on the day of the birth the same women can express exactly the opposite in a nonverbal way. I remember a certain number of births that were going on slowly up to the time when the father was unexpectedly obliged to get out (for example to buy something urgently before the store is closed). As soon as the man left, the laboring woman started to shout out, she went to the bathroom and the baby was born after a short series of powerful and irresistible contractions (what I call a “fetus ejection reflex”). When raising such a question one must also take into account the particularities of the different stages of labor. It is often during the third stage that many men have a sudden need for activity, at the very time when the mother should have nothing else to do than to look at her baby’s eyes and to feel the contact with her baby’s skin in a warm place. At this time any distraction tends to inhibit the release of oxytocin and therefore interferes with the delivery of the placenta. Second question: Can the participation of the father at birth influence the sexual life of the couple afterward? Through such a question we introduce the complex issue of sexual attraction. Sexual attraction is mysterious. Mystery has a role to play in inducing and cultivating sexual attraction. Once there were mother goddesses. At that time childbirth was enigmatic among the world of men. I had the opportunity in the past to talk about the birth of their baby with women who were themselves born at the end of the 19th century. They could not imagine being watched by their husband when giving birth: “And what about our sexual life afterward?” was their most common reaction. Today I am amazed by the great number of couples who split off some years after a wonderful birth according to the modern criteria. They remain good friends but they are not sexual partners any longer. It is as if the birth of the baby had reinforced their comradeship while sexual attraction was fading away. Third question: Can all men cope with the strong emotional reactions they may have while participating in the birth? I am not thinking of a woman watching the TV while giving birth with a drip and an epidural, but of a woman relying on her own hormones. I would have never thought of raising such a question as long as I had only the experience of hospital birth. During the days following a hospital birth, nobody is wondering about the well being of the father. When visiting a family two or three days after a homebirth, I almost always found a happy and active mother taking care of her baby. I had a surprise when asking about the father. More often than not I heard that the father was in bed because he had a tummy ache, or a backache, or a flu, or a toothache, or simply because he was “drained,” as a mother told me. When referring to my experience of homebirth, I am tempted to claim that male postnatal depression is more common than female postnatal depression, although it is not recognized as so. The concept of male postnatal depression is a reminder that many cultures have rituals whose effects are to channel the emotional reactions of the father. All these rituals belong to the framework of the couvade (anthropologists use this term that originally means, in French, “hatching”). These rituals, whatever the local particularities, make the father busy while his wife is giving birth. The last example of couvade was the man spending long hours boiling water. I cannot help thinking of the case of young modern men who spend a long time rebuilding a rented transportable birthing pool: finally the baby is born before the pool is ready. Is it a revival of the couvade? My only objective is to justify a series of questions by suggesting that the issues are much more complex than we commonly believe. It would be premature to offer clear-cut answers. Questions should precede doctrines. 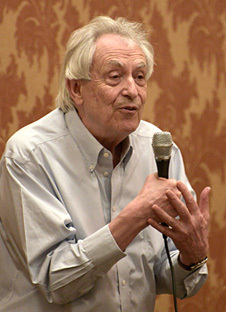 Michel Odent, MD founded the Primal Health Research Centre in London and developed the maternity unit in Pithiviers, France where birthing pools are used. He is the author of ten books published in nineteen languages. Two of them— Birth Reborn and The Nature of Birth and Breastfeeding —were published originally in the United States. His forthcoming book The Scientification of Love will be published in November 1999.